Good news for you! We will be having a POP UP BOOTH this Saturday 17/8/2013 and Sunday 18/8/2013 at Every Little Thing Apparel Market by Public Garden! 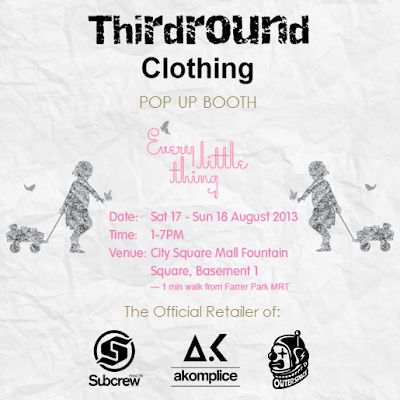 This time round, Every Little Thing Apparel Market will be held at City Square Mall Fountain Square, Farrer Park located at the junction of Kitchener Road and Serangoon Road which is very near to Little India - one of Singapore's top 5 most visited tourist spots. Public Garden has been organising regular arts-centric markets since August 2011. Some of their markets were held at iconic buildings, such as Old School, F1 Pit Building, National Museum of Singapore, The Esplanade and Old Hill Street Police Station.They have also worked with various government projects, including Singapore Arts Festival and NOISE Singapore. At Every Little Thing Apparel Market, you will find local designers, a good selection of vintage pieces from the 1970s - 1980s, personal sellers putting up their beloved collections for sale and gourmet food section with homemade baked goods. So do drop by to visit us as well as other vendors for dope product line up ! Certainly, you're gonna have fun! See ya!